Circular Spectrum Analyzer* is part of the ongoing Cross Current Resonance Transducer collaboration with LoVid. It is a solar energy to sound and movement transducer. 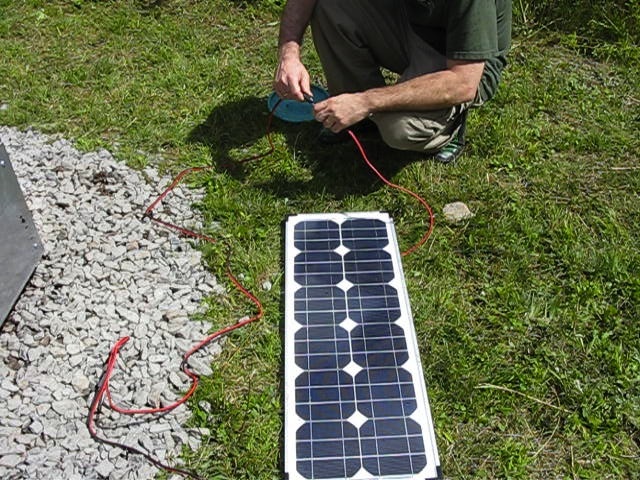 Two solar panels directly power a shortwave radio and two motors. One of the motors continuously tunes the radio across the 19MHz spectrum while the other slowly turns seven wooden discs. The shape and engraving of the discs was determined by data collected from the seven Sunsmile devices in Bonding Energy. The same data was used to engrave intricate patterns on the aluminum body of the sculpture. Circular Spectrum Analyzer is installed in the free103point9 Wave Farm sculpture garden, and was created with generous support from NYSCA, the Greenwall Foundation, and free103point9. Special thanks to interns Richard McMaster, Dana Piazza, and Corey Cleary for their hard work on CSA, and to Galen, Tom, Echo, Maggie, and Comanche at Wave Farm for their ongoing support and installation help. * There is some controversy over the correct name for this piece. Dr. Lapidus insists that it is "Circular Spectral Analyzer," while Mr. Repetto (correctly) prefers "Circular Spectrum Analyzer". Ms. Hinkis has withheld her opinion. video of us plugging in the solar panel for the first time! It's important to be direct: Our family supports social justice and environmental organizations like the ACLU, Accion, BLM, City Harvest, and WWF. Please work to support diversity and fairness in your community.